One of the most recognizable family names in and around the Mackenzie Delta is the Scottish name of Firth. In 1871 the then 18-year-old John Firth left his ancestral home in the Orkney Islands and signed on with the Hudson’s Bay Company. For two hundred years the Hudson’s Bay Company had been hiring young men from the Orkney Islands and sending them to work in northern Canada. They continued this tradition with John Firth and sent him to what was then the most remote trading post in all of the Hudson’s Bay Company lands, the tiny Peel River post now know as Fort McPherson (map). John Firth’s ‘strong and forceful character’ brought him to the attention of his superiors and in 1876 they put him in charge of the Peel River post, a weighty responsibility considering he was only 23 years old. In 1878 John Firth renewed his contract with the Hudson’s Bay Company, married a local Gwich’in woman and learned to speak the Gwich’in language. It was his combination of steadfast character and knowledge of the Gwich’in people that secured his future in the north. Over the years he was given increasingly responsible positions at the various Hudson’s Bay posts that traded with the Gwich’in people, including several in the Yukon. By 1893 John Firth was Chief Factor in charge of the all the trade in the entire region and is known to have ‘laid down the law’ when it came to long standing feuds between the Gwich’in and Inuvialuit people. This is when he earned the nickname Emperor Firth. He even had legal authority to back up his rule. He was the government appointed Justice of the Peace for the region during a time before the arrival of the Royal North West Mounted Police, yet he often chose to negotiate or mediate rather than throw people in jail. Technically John Firth retired from the Hudson’s Bay Company in 1921 yet some claim that he continued to control much of went on in the community until his death at Fort McPherson in 1939. 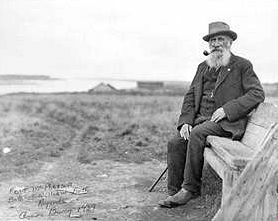 It was common to see old John perched on the bench outside the company store keeping an eye not only on a long stretch of the Peel River but on all the goings on in the community. John Firth’s lasting legacy in the north is of course his numerous descendents, some, like former NDP Member of Parliament Wally Firth or the cross-country skiing champions Sharon and Shirley Firth, have gone on to find their own form of fame. Photo of William [John] Firth Fort McPherson, 1929. Photographed by Amos Burg, Juneau, Alaska.